Genesis Gaming, the software developer behind “Deep Sea Diver”, one of their more popular video slots is now being distributed via the Quickfire gambling platform. This came as shocking news when Microgaming, the owners of the Quickfire platform announced that this slot would become a part of their list of games. This slot will now become available to all online casinos which support the Quickfire platform, this platform includes hundreds of different slots as well as video poker titles, table games and parlour games. Those whom play this game will be able to travel into the unknown world of deep oceans. Along the way wilds, multipliers, two bonus rounds and changing themes are also available in this slot 5-reel casino game. 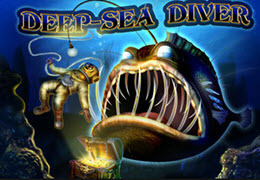 Deep Sea Diver is now available to all whom want to play at all online casinos supporting the Quickfire platform. Registering an account, which only take seconds will open the doors to a casino which offers hundreds to thousands of titles. Experience these games today.